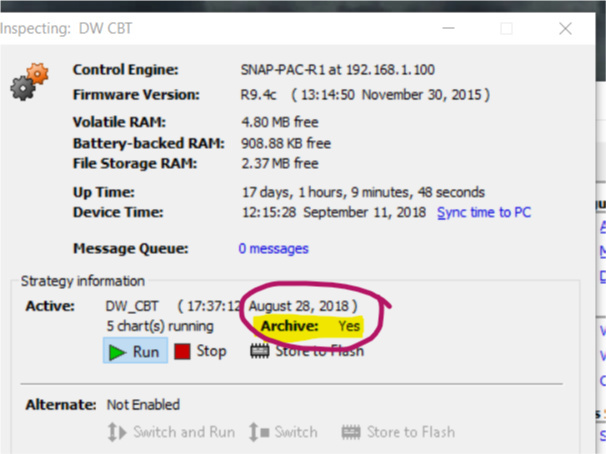 How to upload Control Program from SNAP PAC-R? We don’t have the original control program that is used for snap PAC-R controler. We would like to acees PAC so that we can monitor and Edit after uploading. I’m crossing fingers for you that the archive is down there! My strategy is archived on the PAC. The question still remains, how to I get it from the PAC to PAC Control so I can work with it? Not seeing an answer in any of of the links. I got the same issue, but I think there is no strategy archived in the controller, or something like that. How can I be sure? The link you provided is down. And in the case it’s not there, What can I do? It’s now here. Keep in mind the original project was probably done with 9.x and you will probably want to stick with that version of PAC Project if possible. I have found updating a 9.x project to 10.0 unreliable. Configurations get changed/reset/stuff stops working. Opto peeps: Is there a way to get the previous version of PAC Control? If there is indeed no archive, there is nothing that can be done short of a re-write of the program from scratch. An archive should have been stored (on the pc) when the original strategy was uploaded. Perhaps you can find that somewhere? They are all on the ftp site. Archive is not there, but I found some old backups on the PC that I’m working on. How can I be sure that the last backup it’s the same as the one programmed right now? When you go to debug, it will tell you if they are different and prompt you to download. In that dialog it will show you the date and checksum of the running strategy. Cancel it if you don’t want to overwrite it. If they are the same, then you will go right into debug. ok thanks a lot for your help, I’m gonna try that.